Many New Jersey towns have recovered from the 2008 housing crisis significantly faster than the rest of the state and are even experiencing higher home values than they were prior to the downturn. High demand by buyers and a relative housing stock shortage are sending real estate prices through the roof. Using Zillow’s Home Value Index, a recent article in NJ.com listed 19 New Jersey towns that have experienced unprecedented growth and their highest median home value at the beginning of 2017. Weehawken tops the list with a Zillow Median Value of $727,400, which is up 25.15 percent since March 2016. Located just north of Hoboken (number 5 on the list) and benefitting from Hoboken’s saturated market and a surge in development, buyers have looked to and settled in the waterfront community with an easy commute and New York City views. The Weehawken Library is celebrating the township’s special relationship with Alexander Hamilton this month with two unique events for the public. First, the Library Board of Trustees is pleased to announce the acquisition of a new bust of the American icon, cast by noted artist (and former Weehawken resident) Giovanni Rapetti. The sculpture, which is cast in bronze, will be on permanent display at the library. The dedication of the Hamilton bust will be held on July 9th at 1 p.m. in the library’s historical room. Born in Como, Italy in 1862, Rapetti studied with Frederic August Bartholdi, designer of the Statue of Liberty. His contribution led to his name being inscribed in the statue’s crown. His most well-known personal works are both found on Boulevard East; the Soldiers and Sailors Memorial dedicated in 1930 and the Alexander Hamilton Memorial, which sits on the cliff area at Hamilton Avenue, high above the location of the bygone dueling grounds. The Hamilton Memorial was dedicated in 1935, the year before Rapetti’s passing at his Weehawken home on June 23, 1936. On Tuesday July 11, acclaimed writer Dr. Robert E. Wright, business, economic, financial, and monetary historian, will host a special presentation on Hamilton at the Weehawken Elks. As part of “Honoring American’s Hero” he will discuss the high bar for achievement necessary to deserve the title of “American Hero” as it relates to Hamilton’s key role in the transformation of the United States from 1785 to 1795. He will discuss many of the problems faced by Hamilton during those years, his proposed solutions and the remarkable results. Dr. Wright is the Nef Family Chair of Political Economy at Augustana University in Sioux Falls, SD, where he teaches courses in business, economic, financial and policy history. He is the editor or co-editor of 21 volumes and the author or co-author of 18 books, including “The Poverty of Slavery: How Unfree Labor Pollutes the Economy” (Palgrave Macmillan, 2017). This special event is free to the public and will be held at the Elks Club. Dr. Wright’s address will begin at 7 p.m. followed by an open talk session at 7:30 p.m.
Co-sponsored by the Weehawken Historical Commission and the AHA Society, as part of CelebrateHAMILTON 2017. An evening of Colombian Cumbia music is the latest project by bandleader and multi-instrumentalist Martin Vejarano. The concert will take place Wednesday July 12 at 7 p.m. at Lincoln Harbor Park, just north of the Chart House restaurant on the west bank of the Hudson River in Weehawken. The venue is reachable by Light Rail to the Lincoln Harbor stop and also by NJ Transit bus 158 from Port Authority and towns to the north. Free parking is available at the Weehawken Recreational Park and also in the parking deck behind 1000 Harbor Boulevard. Please use 1600 Harbor Boulevard for GPS directions. The concert will feature favorite Cumbia hits from the golden years of this extremely popular Latin American music. 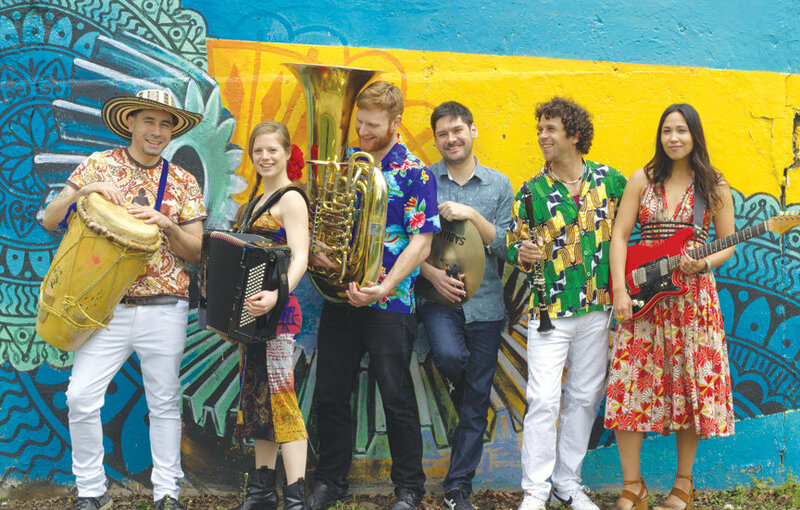 For this special event, Vejarano will also perform with his ensemble Chia’s Dance Party, an adventurous and festive group playing original compositions rooted in the marching band traditions of Colombia; the band is also influenced by the sounds of jazz and classical chamber music. These two unique ensembles will join forces for the first time to create a new and exciting sound. Limited seating is available, however, audience members are asked to bring a lawn chair or blanket, if possible, and encouraged to picnic on the lawn. A rain date, if needed, will be scheduled for the following night. For more information including the full summer concert schedule, directions, updates, and rain date info, please check the HRPAC website…www.hrpac.org… or call the concert info line at (201) 716-4540.